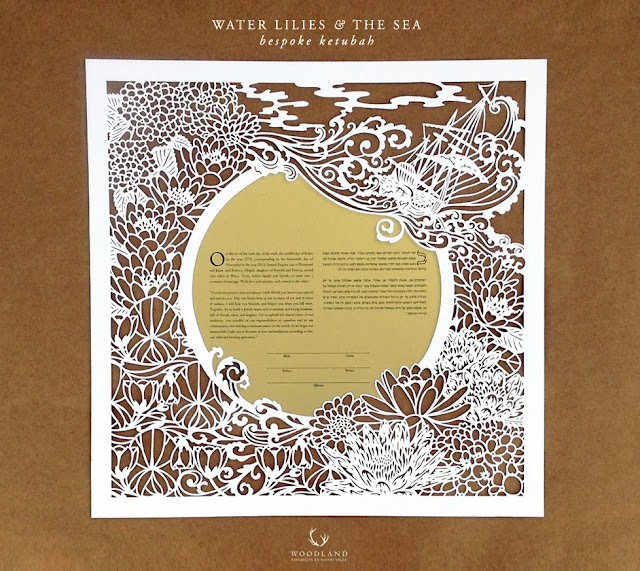 Today I'm showcasing a bespoke ketubah fresh off the boat (and yes, there's a ship in the papercut)! It was commissioned by a very cool & patient couple, Abby & Sam, who are getting married TODAY! Abby first contacted me requesting a ketubah design of abstract Art Nouveau patterns with a watery quality. We went back and forth on the designs and I really thought I screwed it up, but in the end they loved it with lots of dramatic waves, water lilies and hydrangeas! The text was printed on my shimmering gold paper and backed with a midnight blue paper. Later they will replace the midnight blue with a special watercolor painting by the bride's mother - how unique! The design went through 3 revisions. Honestly, this ketubah was hard to make a preview of, the scan kept cutting off the thin lines, but I trusted the general idea was clear. Below are the previews the clients were sent after every feedback. Here are photos of the finished ketubah, without and with the midnight blue background. Which do you prefer? Hi, I just happened to come by your site..... 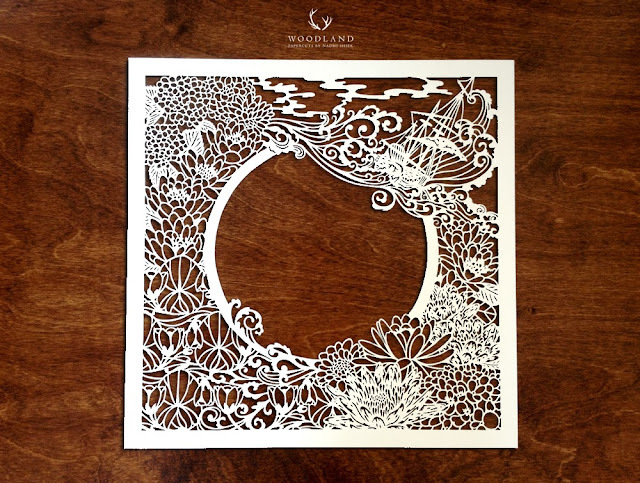 I envy people that do these beautiful cut work. I can not do these as my hands are bad & it would not turn out well at all... haha, it would end up screwed up & thrown in the nearest bin. I love the whole lot.... the paper, the time, the effort, the artistic ability, the patience... it goes on & on. You ask which we prefer, the blue background or tan..... I love the tan colours myself. It is just amazing, the whole design!!!! The closest I come to paper cutting is I have a computerised machine that I can send designs to & it will cut them out for me called a Silhouette Cameo. I know it does do designs, etc. but yours are so individual & amazing, you can not repeat something by the thousands & that's not a bad thing... you can feel the passion & time you spent dreating this one off piece of art..... Thank you.